NAIROBI, Kenya (CNN) -- Pirates holding a Saudi-owned oil supertanker off the coast of Somalia have set the vessel free after receiving a ransom payment, a piracy monitor in neighboring Kenya and the U.S. Navy Fifth Fleet said Saturday. A small aircraft drops a ransom payment during a flight over the Sirius Star on Friday. "The supertanker VLCC Sirius Star is currently under way to safe waters," Andrew Mwangura of the Kenya Seafarers Association said in an e-mail. Mwangura said all 23 crew members of the Sirius Star, the largest ship ever hijacked by pirates, are safe and in good health. They are citizens of Croatia, Great Britain, the Philippines, Poland and Saudi Arabia. "Anytime a ship is released, it is positive news," said Cmdr. Jane Campbell of the Bahrain-based Fifth Fleet. "But too many people see it as a ship and its cargo being released. When merchant mariners are released, it is always good news." The ship is a VLCC, or "very large crude carrier." According to the Fifth Fleet, the tanker is more than three times the size of a U.S. navy aircraft carrier. 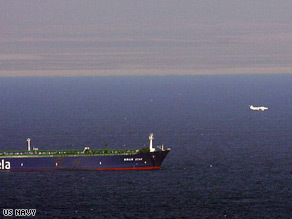 Pirates seized the supertanker November 15. The tanker was carrying two million barrels of crude oil worth about $100 million. The Liberian-flagged tanker is owned by Vela International Marine Ltd., a subsidiary of the Saudi Arabian-based Saudi Aramco. Saleh K'aki, president and CEO of Vela International, said in a statement, "We are very relieved to know that all crew members are safe and I am glad to say that they are all in good health and high spirits. This has been a very trying time for them and certainly for their families. We are very happy to report to their families that they will be on their way home soon." Mwangura said it would have been a "disaster" if the pirates had fired guns aboard the ship, harming the cargo or igniting a fire. "The capture of the Sirius Star raised the specter of an environmental disaster should the hijackers decide to turn the ship into a weapon or foreign navies attempt to release it by force," he said. There were five pirates in the skiff and one survived, the journalist said. The bodies of the other four were recovered, he said. The pirates told another journalist they received $3 million in ransom money but lost part of it when the skiff capsized. "Initially, the gunmen were demanding $25 million for its release but the latest reports indicate that the demand had been lowered to below $3.5 million," Mwangura said. Meanwhile, pirates also have released the MV Delight, an Iranian chartered ship carrying wheat from Germany, Mwangura said. It was captured in November. Details were not immediately available. Campbell said the number of attacks may have gone up in recent months, but the number of successful hijackings has gone down. She attributed that to measures taken by merchant ships, such as vigilant keeping of watch and evasive ship maneuvers, and the increased naval presence in the at-risk areas. Campbell stressed, however, that they are only preventive measures. "Piracy is a problem that starts on the shore," she said. "The international community needs to address the situation on the ground in Somalia."